I know that you are aware of my obsession with Florence+the Machine. My recent attendance at her concert has made it an even bigger obsession, if that’s even possible. I don’t mean a stalker kind of thing, just a greater love and appreciation of her music and her personhood. The concert was held in Santa Barbara at an outdoor ampitheater, scheduled to start at 8pm. I hate being late, so for an hour long trip, I made the family leave at 4:30. You always have to take into consideration the traffic in Southern California; apparently not so much on a Saturday afternoon. With my husband Jeff (aka Mario Andretti) at the wheel, we made it in 40 minutes. The family was really kind to me about the early arrival. Sighs, eye rolls and lots of sitting in the car staring at me ensued. That was really fun! I had planned ahead for once, and brought a little pre-function picnic. It was a little weird to have dinner at 5:00, and it only killed about 10 minutes. Great, more family time! Finally, it was time to walk to the venue; a pretty setting on a chilly but clear night. I had prepared with a hat, gloves, hand warmers and 20 pairs of ear plugs. Ever the Mother, I wasn’t going to be responsible for the potential hearing loss of my 13 year old. By the time we were seated, there were about 10 people there and we were 5 of them. Thank God heavy pours of wine were available. As I looked around, I did notice that my husband and I were pretty much the oldest there, by about 30 years. I had a feeling we might be spoiling the vibe of the groups of groovy looking youngsters around us, but I didn’t care, I could heart Florence just as much as they could. That’s me and Florence. I’m practicing my moves pre-concert. The concert opens with the theme of her latest CD, ” Ceremonials” with huge tribal looking draperies in the background. Then Florence comes out in a medieval priestess looking robe with a black cat suit on underneath. There aren’t any big TV screens and we’re a little far back to see her in detail. Again, I didn’t care, because there she was; even if a bit tiny and far away. The music started and she owned the stage! She was a whirling, twirling kind of otherworldly wood nymph. She’s so charismatic that you really can’t take your eyes off of her, even if you have to squint. She sounded great, the crowd was into it and there I sat, proud of myself for being a true fan, knowing all the lyrics. I knew enough though, to not ruin the experience for the people around me by singing along in my screechy, totally out of tune voice. I was just happy to be there, soaking up the scene. That is, until the song “Spectrum” came up. It’s one of my favorites and the one I like to do some interpretive dance moves to when I’m doing my nightly walk. It was late into the concert, the smell of weed was in the air, and most of the people were standing and really into it. It was my chance to let it all hang out and officially join the concert. Confident that Florence would have wanted me to, I get up and not only sing along, but do all my interpretive dance moves to the song. Jeff is laughing his head off on one side of me and Conrad (the 13 yr old) is on the other, with his hood pulled over his head, hoping to God that he doesn’t see anyone he knows. My older kids, Anna and Ben, are both in the standing room only section at the front. They already knew that this might happen and planned ahead to be somewhere else. Fortunately, for the people around us, the concert ends soon after. 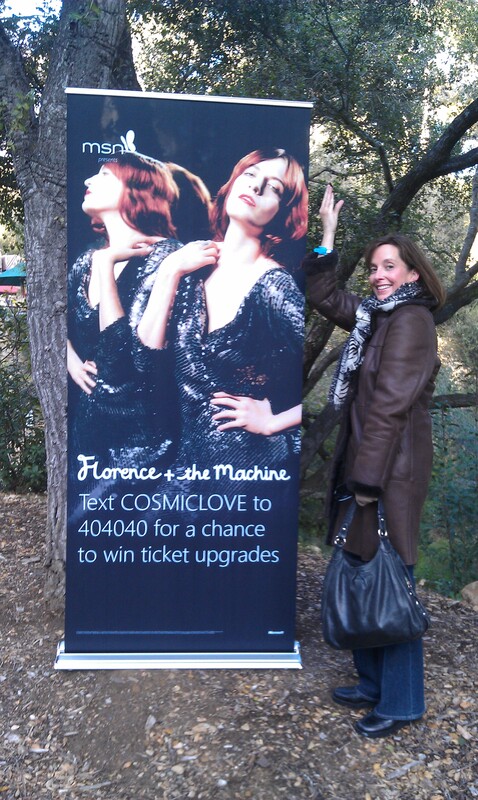 We meet up and all agree that the concert was too cool and that Florence is a star. I’m still in a bit of an afterglow from my evening with Florence. I do love my family, but I think, for a while anyway, I love Florence more…. Move aside Isley Bros., there’s a new Priestess Wood Nymph in town! This will be our modern version of trading records again. I apologize for ruining the Isley Bros. for you by singing along. Well the truthiness comes out…Mom loves Florence more than her own family. I feel abandoned. I am still trying to get a visual of you dancing. However I do remember you as the most talented of keeping a beat.